MANCHESTER, N.H. — St. Thomas Aquinas and Dover each took the same path to get here, both literally and figuratively. Two schools, residing a mere four miles apart from one another, ventured down Route 101 Saturday in a quest for glory. It is on those rare occasions where you find two programs from the same community vying for a state championship in any sport. That scenario played itself out during the NHIAA Division 2 final. Having split their two regular season meetings, it was the top-seeded Saints who made the most of the one that mattered most. Behind a pair of goals each from Zach Talbot and Patrick Vetter, St. Thomas Aquinas was able to fend off the Green Wave, 5-3, inside SNHU Arena. The victory marked the first state title for the 19-2-0 Saints. Dover, the second seed, closes out its fine season at 16-4-0. Dover goalie Austin Gilbert stones St. Thomas forward Mathis Savard with this second period stop. St. Thomas Aquinas held two goal advantages twice before the Green Wave fought its way back. The Saints jumped out to a 2-0 first period lead and appeared to be cruising early on. Talbot, from a sharp right angle, skidded a shot beneath the pads of unsuspecting Dover goaltender Austin Gilbert just 6:25 in to make it 1-0. Six minutes later, Geoff Smith, taking a corner pass from Jacob Beaumont, rifled a shot from the high slot after Gilbert had creeped out of the crease to try and cut down the angle. However, with nobody near him, Smith, a senior defensman, unloaded a laser glove slide that Gilbert was late in catching up to. After getting a good talking to, the Green Wave came out for the middle period a completely different unit. After watching St. Thomas Aquinas be in control through much of the opening frame, Dover was able to reverse that trend. Now starting to take the play to the Saints, the Green Wave began to generate a bit of space once inside the attacking zone. At 7:44, sophomore Asa Forbes tapped a pass over to Aidan McDonough, who was positioned down at the low, right corner. The senior quickly sent a one-timer past Hannes Viktor Demegard, cutting the deficit to one. Less than two minutes later, Dover notched the equalizer. Jake Leclerc, cutting in from the right circle towards the open slot, fired a shot by Demegard (20 saves). In an instant, things had changed dramatically. But Dover’s momentum swing didn’t last for long. After Sheehan called a time out to settle down his troops It took just 45 seconds, following Leclerc’s tally, for the Saints to re-take the lead. With Talbot streaking into the high slot untouched, the senior was given a nice lead pass from Mathis Savard, before lifting a backhand by Gilbert. St. Thomas forward Patrick Vetter (two goals) is defended by Dover’s Jameson Goodridge. With just over four minutes remaining in the period, Pat Vetter, off a turnover, uncorked a shot from just inside the blue line that made its way past Gilbert, giving the Saints a 4-2 edge. That would be all for Gilbert (13 saves) as he would be replaced by Devon Lapierre. With time winding down in the frame, Dover continued to show some grit. With St. Thomas Aquinas’ Jacob McGuire just one step out of the penalty box, the Green Wave got one back. A shot by Doug Gnall, from just inside the blue line, deflected off the chest of Axel Post. 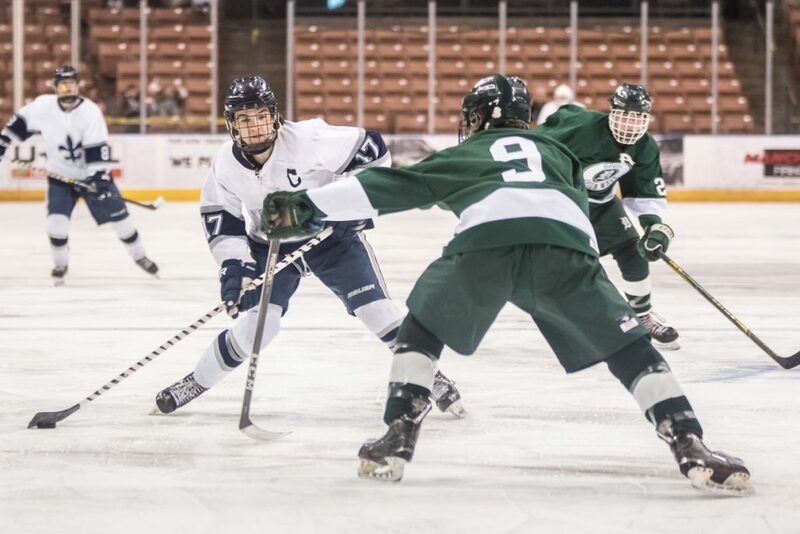 The senior defenseman had the wherewithal to locate the puck in traffic, and the mindset to complete a spin-o-rama out in front which snuck by Demegard, sending the Green Wave into the second intermission trailing by a goal. Throughout the third period, the Saints went into defensive mode, determined not to let Dover’s up-tempo offense sneak behind them for any easy opportunities. 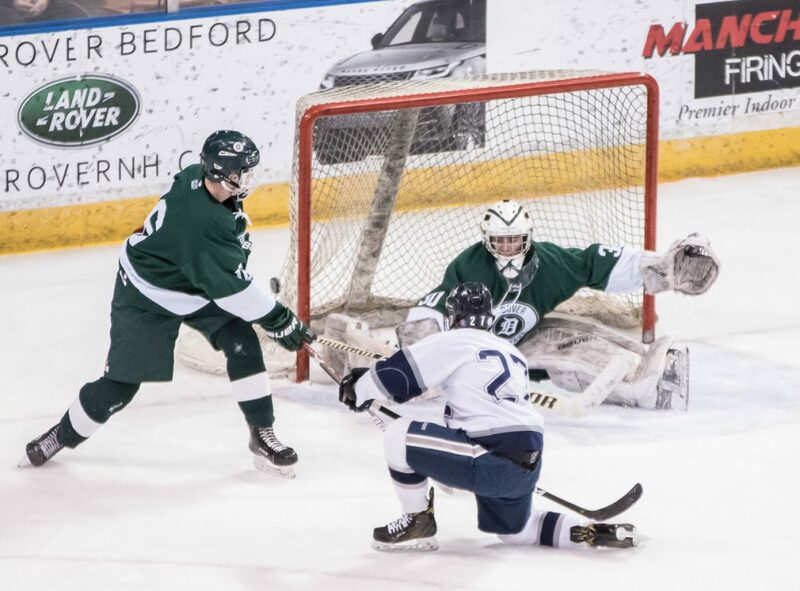 With Lapierre pulled late for the extra attacker, Vetter capitalized with an empty net score and, in the process, dismissed the Green Wave’s attempts to capture their seventh postseason title in school history.